Many of you are wondering how I can go so many places and work in so many countries without knowing all of the languages. My heart languages are Arabic and English. However 30% of the Hindi language is derived from Arabic. So I can get a few words in, but my two friends here, Hanson with his family and Steve, helped me in the villages with translation. Hanson is a real blessing as he is one of the only people who can go with me to the villages who speaks Kutchi. Kutchi is an unwritten language and only a few people outside of the tribals know it. Hanson is hired often for his wonderful work in translating books to Kutchi. 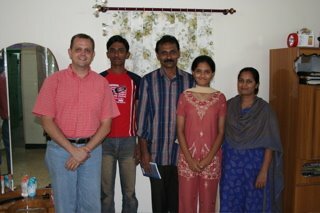 My friend Steve came from Varanasi to help me teach in Hindi. As you see, Susanne and I get by with a little help from our friends. In India there are some hundreds of languages, so as we travel through India we count on the help of many such friends and translators. Over the years they too have become passionate about our work. Hanson along with some local leaders are now helping other social workers learn the language so soon I will have many people in villages with language learning.